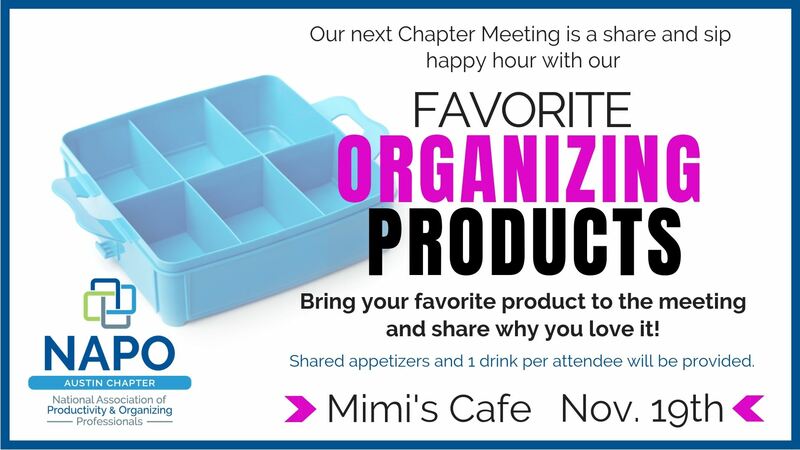 Come join us for a share and sip happy hour for our November Chapter Meeting. This is one of our favorite meetings of the year! Be sure to bring your favorite organizing product (or two) and participate in a 'round the room show and tell. You can also share the product cost, where to buy it, and what you use it for. Don't have a product to bring? Tell us about an app on your phone or a website you love. Meeting begins at 6:30 p.m.
For our share and sip happy hour event, shared appetizers and 1 drink per attendee will be provided. Non NAPO Member Guests are welcome to attend at a cost of $25.00 per meeting (optional meal at guest expense). Please register if you plan on attending. We look forward to seeing you!